There is nothing better than the birthday of your beloved, the perfect occasion to celebrate in style the birth and life of a loved one. When we love someone, then his birthday becomes the perfect excuse to give him all of our love and, why not making it better by adding an extra loving detail? A present and birthday greetings filled with the greatest feeling on Earth: love. If your beloved’s birthday is coming, then it is important that you prepare for the occasion by organizing surprises, gifts, and above all, your love. If you think a birthday greeting is what you need to let him know what you feel, then we invite you to review the options that we present on the paragraphs below, because we believe that they may be exactly what you were looking for in this special occasion. We encourage you to review them and remember that they are completely free, so all you have to worry about is to make your beloved read it once he received it. :: “Beautiful baby, come and tell me what you think of my surprise, because nothing would make me happier than to hear from your lips what you felt and how surprised you were. Hold me like if there were no tomorrow, to whisper in your ear my deepest feelings of love. I love you more than anyone else does and you are too special to me, so I expect you to have the best birthday yet, surrounded by all the people who loves you. A big kiss and all my love”. :: “I often pray to the Lord, asking Him to take care of you, to bless you and so you never miss anything you could possibly want. I think He is listening to me, because I used to ask Him to let me find someone worth the while, and He let you to be the one I met. I love you and wish you a birthday full of joy, love and many beautiful emotions. I love you, do not forget that and keep it in mind at all times and at every step you take”. :: “Hello sweetheart, I am write to warn you. I know you do not like surprises so I prefer you to be prepared; today we are organized a small evening with the most beloved people at home. It will be a dinner between your closest friends and us, so you can set up something with your office buddies for another day. XOXO, have a great one. PS: I will make sure everything goes as smoothly as possible, so you do not need to worry about anything for I am now the one in charge of everything”. 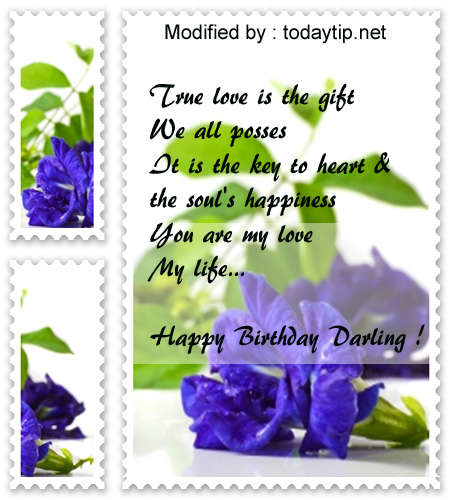 :: “Hello love, your birthday is here and I am happy to be the lucky girl who gets to celebrate it with you. I want you to know that I love you too much and that I am very proud to be with you. You are a super special person with an incredible initiative, a motivation that goes beyond the standard and the most charismatic empathy I have ever seen. I am sure that you will get wherever you set your mind to. Happy birthday, you are the best of all the boyfriends in the world”. :: “Sugar bear, I would like to bring you the moon because you deserve nothing less. I hope you enjoy reading these lines I have written for you with all the love in the world. I wish you had X-ray vision, so you could see how my heart races when I see you. Happy birthday, may everything be filled of joy in this beautiful day”. :: “Hello cutie pie, today I am writing to wish you all the happiness of the universe and beyond. I hope the Lord blesses you and always protects you. Celebrate without thinking about tomorrow, and do not be stressed, because I already took care of everything. Just worry of being handsome because you know how much I enjoy taking tons of pictures. Happy birthday, my adored prince charming”. There is nothing nicer than receiving something done with the heart and all the love in the world. Let your boyfriend know what you feel about him and share it in a phrase as the ones you have seen above. You can be sure that he will love your details and that he will feel very happy and honored to receive it. Come back soon for more free greetings. Good luck! When a boy and girl love each other, they make every moment of their lives happy and especially if any of the two is celebrating years. Maybe you want to send an early and affectionate greeting to enclose all the love you feel and make them feel very special. In this article we offer some options of messages you can write to your lover. Post these greetings to his wall on the social networks, send them through a text message or a card for the occasion, or you can also say them when you meet. We hope that you can send some of these messages to your loved one to celebrate his birthday and always remember that day. Always remember to come back for more greetings for other celebrations. It is really amazing to stop a bit and assess how technology has developed in recent years. Now we are really connected with everyone and there are no barriers to communication. Just with a few clicks they are no longer clicks on touch screens and we have the world at our feet. If you are close to people who, for one reason or another, are away, it is important to give yourself time to maintain contact and, frankly, with the internet and telecommunications, there is no excuse. A very good excuse to send an affectionate phrase is the day of the birthday of a special person, so go on and review the sentences that we propose beneath to send greetings to the birthday boy or girl through Facebook. Do not forget that you will not pay a dime to use them. :: “For me, there is no more important than this day in which when we celebrate your birthday. You are one of the persons I love most in this life and, although we are not physically together, there was no way I would not send you these lines to let you know I think of you and I wish you the most beautiful things in life. May the Lord bless you and may you have thousands of projects, goals, emotions, adventures and loves in your life. Have the greatest times of all, XO”. :: “Your birthday is here and I want you to know how happy that makes me. Despite the kilometers between us, our hearts beat to the same rhythm, the relentless rhythm of friendship that nothing and nobody can ever destroy. I have seen you more beautiful than ever in your Facebook pictures, it makes me very happy that you are doing so well and I wanted you to know so. See you soon and may the Lord guide never fail you. Best regards”. :: “You know that I can hardly express myself and I really do not know what to put on these lines, but gradually, as I thought of you, it became easier and easier to put my feelings and desires in words. I love you; I want this birthday to be special for you, and may all the people you love and loves you dearly surround you. I hope to see you shortly to greet you properly. Happy birthday”. :: “Let us celebrate, let us party, let us forget about the problems and think of all the nice things that lie ahead, a beautiful future where I know we will be together, as always, my beautiful friend. I hope, with all the strength of my heart, that anything you want becomes real. Happy birthday”. :: “I will never forget today’s date, regardless of how far we are, even if I do not have Facebook to remind me of it, because I do not need electronic help to remember your birthday when I have you in my heart as deeply as you are. We have always had a wonderful adventurous spirit and I know that soon the future will bring us a reunion and a new adventure. I love you, happy birthday, dear friend”. :: “I know for some it may sound exaggerated and others do not give much importance to it, but that is definitely not my case. Today is your birthday and I do not care about anything but celebrating together, even though it may be only virtually. Let me know as soon as you are free to give you a quick call and to let me know how you have been spending time. I hope your birthday goes great. I adore you”. There is nothing cuter than an affectionate phrase received from an important person for us the day of our birthday, especially if we cannot be physically together. Imagine how happy he or she will be. Come back soon, the best of lucks! 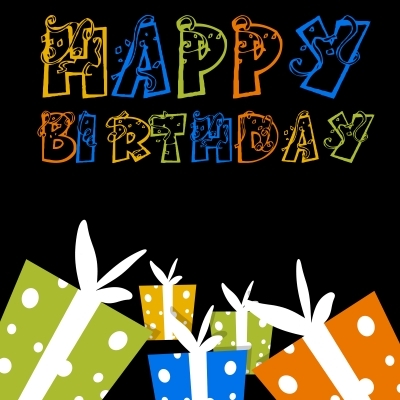 Send your originals happy birthday messages for my boyfriend , and will be published, others friends will thank you . Thank you very much I get a few message to send to my husband its so nice and cute. Thanks alot, you’really made things easier. but pls is there a way you send it direct to my boyfriend with my name stated on it or any other special way, like you given him a call. pls l like to hear from you. Thanks ! you help me to find a Simple but cute idea ..
Thnk yu vry much for ur tips abt birthdae msg,s I ws rilly stuckd wht I ws gona say thy helpd me a lot.